The multi-instrumentalist Paul Bonrud has together with strong, clear vocals from Rick Forsgren and hard hitter Paul Higgins on the drums done a beautiful disc. They have a bunch of guest keyboard-players on 'Save Tomorrow'; Richard Baker (Santana, Saga), Eric Ragno (Graham Bonnet, Fergie Frederiksen, JSS and Dave Gross). Paul and Rick have done a marvelous work on this album and together with Keith Olsen, as the producer, they hit a jackpot with 'Save Tomorrow'. The melodic songs are very well written and are well over my regular OK score. Rick Forsgren's name made me curious, (is he of Nordic descendant?) so I Googled him and boom! I found a link on youtube where he sings the pants off of Geoff Tate! What a guy! 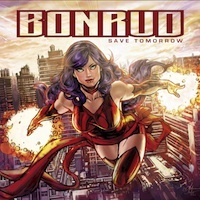 Paul Bonrud has done a very slick and tight album. Rick has got a amazing power and total voice control in a 'Rob Moratti' or Graham Bonnet class. Forsgren is a hidden vocal treasure and he has a brilliant future in the rock industry ahead of him. I return to 'Save Tomorrow' and the brain behind this project; Mr Paul Bonrud. He has written twelve ultra-melodic rock tracks that have all the ingredients a melodic hard rock fan could ask for. He has a strong vocalist and he put his brilliant guitar playing in the front row. I think that Rick is a perfect choice in the forefront of the 'Bonrud' sound, with his wide vocal spectra and he manage to control all the different tempi and pitches. Paul has done a good job with the rest, just proving what instrumental talent he has. The only little mote in the ointment is that there are too many similar songs. With a little more variety, the score would have been even a little higher, but it is the only small spot on the glossy surface. Best songs: 'We Collide', 'End of Days', 'American Dream', 'Blinded', 'Last Sunrise' and 'Bullet in the Back'.